An Earth based Indigenous wisdom nation that holds the Matriarchal Peace teachings of its Ancient Waitaha Elders of Aotearoa, New Zealand as its core values. This was my first time in the southwest and looking outward from the small, window of the plane, with the telescopic advantage that no Indigenous Indian, Latino or Latina child, man or woman of those bygone ages ever had, or could even have imagined. The dreaded tales of my youth in the faraway Pacific, lay sprawled beneath me, mile after mile, after unending, daunting, death filled, desert mile…Or was there in truth…something else? Was there another reality, one hidden away by the people who had lived there under the majestic sun and blasting heat, and been nourished by it, worshipped it for thousands and thousands of years. For if you love something so earnestly, the concept of fear does not exist and the secret to life, as the rest of nature has never forgotten, is made possible. They who had built towering sand castles into the sky to bridge the gap between that which they yearned and themselves. Finally at 12.44pm, my brother Stephen Emerick and I landed at the airport terminal in Santa Fe, where our ever, dependable brother Will Evans was waiting to greet us. We had just arrived in from Dayton, Ohio via Colorado. Beloved Will, had driven from Carbondale, Colorado to be with us for the conference. Prior to leaving Ohio, I had requested by email from sister Caroline Robinson in New Zealand who has acquaintances in Santa Fe, if she could ask any of those friends if there was a particular site close to the Santa Fe Airport where I could perform a small ceremony prior to going into Santa Fe. After making inquiries, Bob and Pamela Mang, friends of Caroline’s, said that their son Nicholas was participating at the same conference I had been invited to. They kindly asked us to breakfast the following day. A good friend of theirs, Joel Glanzberg, who was visiting with them at the time, directed us to a sacred site several miles from the airport directly on our way to our hotel. So, we now had our site for our little ceremony and we had a place to go for a homemade breakfast the following morning. To make things even more serendipitous, Bob and Pamela lived within walking distance – just over the back wall of our hotel. All initiated from New Zealand. Thank you dear Caroline. 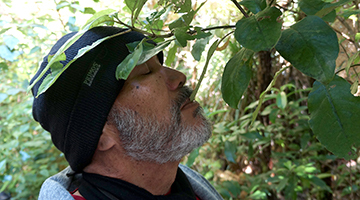 Waitaha, walk gently and sing their songs softly especially in the lands of others for we know the story of dispossession and appropriation and would wish it on no other. We believe every child should have a mountain, a river, and a field to lie upon and dream in. By right of simply being, they should command a place of sanctuary where the air is fresh and waters run free as should the memories of elders reciting histories to those budding generations and cave-dwelling scribbling’s, or sandstone artifacts should be the right of inheritance that they can claim as their very own. Even, those neglected hard-to-get-to-places, where ancestor’s ghostly laughter can be heard often times wafting in the ether, should be made accessible to them. For in indigenous lore, those are the dens and libraries, where permeate, the highest human wisdoms. The site we had been directed to was a ridge that had ancient petroglyphs amongst its rocks. The area was renowned for this particular type of artifact and was some distance from the roadway. We pulled off into the parking lot area and found us a quiet area to perform our ceremony. We three brothers asked the spirits and the ancestors of this ancient Red Land for their kind permission to allow us to come and share our stories and histories. We promised we would listen respectfully to the stories and histories of everyone else and vowed we would respect the ancient Red Land and people of the ancient Red Land while we had the privilege of being here in service. The scared water we had for ceremony came from three continents and Pacifica. Individually, we scattered the water around the site offering our prayers of gratitude as we did. With the Ceremony completed, we returned to our vehicles and it was time for brother Will to take the lead. This particular part called for the Elder to take the reins of headship and find out where we should be and when. Knowing most of the organizing committee, Will did a masterly job in his quiet, most, efficient and agreeable way. Things flowed. Everything seemed so easy. Everyone we met seemed so gracious and willing to help. Will led us to an office where we added a woman to our convoy who took the lead driving her own vehicle and we caravanned from the township of Santa Fe passing through its beautiful stucco boroughs to a beautiful private Retreat situated on the summit of a peak to hold a pre-meet with other presenters of the official opening of the conference. Alas, it was at this meeting we were officially notified that our brother the Lakota Elder Chief Arvol Looking Horse would be a late cancellation from the event due to unforeseen circumstances. Our hearts all grieve that so much is expected from our messengers of peace and our wish is that our love and blessings be extended to all who carry the divine hope that all will be well on Mother Earth. There at the retreat, we were officially introduced to the woman who had been leading us from the township of Santa Fe. 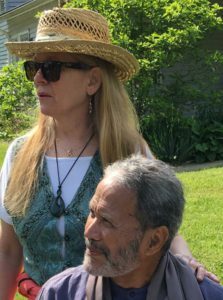 Her name was Cynthia Knudson one of the organizing members and to other people who were there, Alejandro Lopez from NM and Sami guests from Norway, Anneli Guttorm, Lone Ebeltoft and their quiet companion, Nils Sara who would officially participate in the opening of the gathering later that afternoon with Waitaha. Departing the retreat after working out the protocols for the official opening, Will, Stephen and I headed for our hotel in Santa Fe to complete our booking in process, freshen up and prepare for the conference. At 6pm on a warm autumn evening, brother Will Evans honorary Elder of Waitaha in the United States of America introduced Waitaha to the assembly outside the James A Little Theatre in Santa Fe and we proceeded to open the conference. Various feedback suggested that the opening ceremony was a success and Waitaha’s participation in it, fulfilled the organizing committee’s expectations. A close connection was made with our Sami family from the Artic North. They revere the reindeer and their life is bound, one to the other with the animal. They are beautiful people. Waitaha also have a very close friendship with our New Mexican Native son Alejandro Lopez, such an incredible human being. All in all it was a long day of travel people were tired, glad to get here, to be here, to be settled in and were looking forward to the conference. At 8.45pm, the Zuni Olla Maidens Dancing troupe that closed the evening was the standout performance for me. To see the ancient dances still being performed at such a high standard brought tears to my eyes and renewed my faith that the “old” traditional ways were still being kindled in the lodges of the remnant families. The organizational management of the event was as professional as I have seen anywhere. There appeared to be a natural flow and rhythm to everything, which gave the conference an added stature of professionalism. At nights end, without further ado we set off from the James A Little Theatre and returned to our hotel and our respective beds. Thankfully, our brother Stephen had had the foresight to order in cookies and fruit drinks for my room so I was able to wind down with a lovely light supper and reflection before turning in for the night. At 9am Will, Stephen and I, left the Sage Hotel to drive the 3minute drive to Pamela and Bob Mang’s home for breakfast. Joining us was their good friend Joel Glanzberg a permaculture and ecological restoration expert. Joel also had his baby daughter, Eva Alma with him. Joel explained that the name Eva came from the mother of all of us and Alma was his mother’s name and meant “soul” in Spanish. Thank you Joel for the wonderful service to humanity you’re involved in through the benefits you provide working in harmony with nature. With the constraints we were under there was no allowance for us to sit and spend more time together, but I hope other opportunities will present themselves to sit and ask you more about your unique and valuable work. We spent a lovely time together with Pamela Bob and Joel, sharing stories over a beautiful breakfast of fresh fruit, cereal and breads. The hospitality was wonderful and Bob, your explanation of the exquisite decorative ornaments of your beautiful home was appreciated by all three of us. Overall, the time spent at your home was like an oasis of refreshment in a national clime of intolerable debate. Bob and Pamela’s son, Nicholas who was scheduled to speak at the conference, had to cancel because of an injury and was unable to travel to Santa Fe. Dearest Bob and Pamela, I will always treasure you sharing your beautiful story of your beloved daughter Jessica. Her memory will be taken home with me to Aotearoa, New Zealand and with Caroline and our Grandmothers taken on a journey and sung into our sacred land. After breakfast, we headed down to the James A Little Theatre. The following were Friday’s most meaningful presentations for me. Three of the most powerful speakers I’ve seen and heard in some time. Waitaha was given the privilege of opening the day’s proceedings. The protocol took place inside the auditorium in front of the stage with microphones set up. Elder Will Evans introduced Raymond who began the ceremony by inciting a karakia (incantation) in his native tongue of Maori. To translate, he had asked his New Mexican friend Kitty, who he had met the previous day. While the incantation was being recited, brother Stephen Emerick was softly playing his flute as an accompaniment in the background. Raymond then gave a brief statement to the gathering about not leaving behind indigenous cultures and the ancient wisdoms they could bring in living in harmony with Mother Earth. Judy Wicks – Author, activist, and entrepreneur. Working To Build A More Compassionate, Environmentally Sustainable And Locally Based Economy. New Zealand and her small towns could do with more of you, Judy Wicks. Alejandro Lopez – Youngest child of eleven. Under pressure from the “biggies,” he kept the family farm and kept it all together. Winona LaDuke. I felt our communities at home in New Zealand could learn a lot from this Wahine Toa (Woman Standing Tall, in my language of Maori) Winona LaDuke, environmentalist, economist and writer. The finale performance was flute maestro Robert Mirabal, a Pueblo musician and Native American from Taos Pueblo. The maestro’s performance was outstanding, and ably supported by his two beautiful daughters. On Sunday, everyone who made a presentation or was part of a panel discussion at the conference was invited to a luncheon at an unknown location as a thank you from the conference organizers. 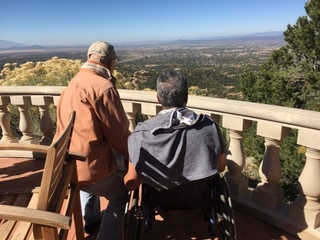 After a mystery shuttle ride, the final part up a semi private mountainous route (Raymond, Will and Stephen were given special dispensation to use their rental vehicle), the location turned out to be atop a mountain with a sweeping view overlooking Santa Fe Valley. There we were, entranced by the miraculous views, and a little later entertained by flamenco music and dancers. The crème de la crème of it all, a full four course dinner served and waited upon by the most helpful and polite young women and men you would ever hope to meet. The meal was delicious, and my dinner companions were incredible and will remain indelibly itched in my memory for the rest of my days. To all the volunteers who worked at the Economics of Happiness Conference; those who opened doors, sat at bookstalls and gave out pamphlets… thank you. To those incredible young women and men who waited tables and brought us drinks… thank you. To those gentlemen in the car-park at the James A. Little Theatre who went beyond the call of duty and ensured a disabled guy always got a safe, handy parking space… thank you. Thank you one and all. Santa Fe has sons and daughters that would make any community in the world proud to call their own. I would like to thank my friend, mentor and elder, Will Evans, MD for his unwavering, unyielding search for that tantalizing missing ingredient to that which promises to make our two-legged family even more magical. I would like to thank my friend, mentor and brother, Stephen Emerick, Psychologist, for doing all those important physical things in the world I can only now sit, watch and imagine. All those things make my things possible. Thank you brother. I would like to thank my Jenny, for keeping the heart-fires burning warm and bright so that her wanderer, and the songs he’s been entrusted with, will always find their way home. My name is Raymond TeKorako Ruka. I belong to a matriarchal peace nation from Aotearoa, New Zealand called Waitaha, the water carriers. I live in Yellow Springs Ohio with my beloved wife, Jenny. I am an Elder and Tohunga (priest), and I speak on peace and love.